Xtracycle is a an amazing product that has changed a lot of people’s lives for the better. Their system allows you to take any bike and convert it into long bike to carry a big load. However, there have been some gaping holes in their offerings. Thankfully they’ve addressed many of these concerns with their newest additions to the Xtracycle product line.When I reviewed the Surly Big Dummy (a full frame built to use the Xtracycle system), my biggest annoyance was the kickstand. Once you get any kind of big load on the bike you would see that thin piece of metal start to develop a precarious bend. Plus, I was constantly having to maneuver the bike to sit just right on an incline so it wouldn’t topple over. Another major problem people have had with Xtracycle is the requirement to use their own proprietary FreeLoader bags. In order to make the Free Radical more “open source” and touring friendly, they’ve expanded these options. The new Adventure Rack is built to fit the Free Radical and accept standard panniers. Also, the TekDeck snaps on top with strap eyelets to allow you to easily tie down a bedroll (or beverage). I do have one issue with this new addition to their product line… the price. The Adventure Racks are $75 a piece and the TekDeck rings up at $89. That’s a total of $239. The original long tail kit that includes two V-racks, two FreeLoaders and a Snap Deck is only $279. So this new system is only $40 cheaper and you have to supply your own bags. I would have liked to see the price point come in lower to allow people a cheaper entry into the Xtracycle life if they already have their own bags. Xtracycle-specific Chromoly frame, mated to a painted-to-match FreeRadical. Rear 8′ (203mm) disc brakes, V-brake front. 8-speed rear derailleur with a generous gear range. Full Xtracycle Longtail kit with Freeloader bags and Snap Deck comes standard. Glowspeck LED Pedals for safety and visibility. Check out all the new Xtracycle accessories. There’s sure to be something that will fit your style and needs. I’ll leave you with this… my car never sat unused as much as when I was using Xtracycle. It will change your life. Best review of Xtracycles Interbike booth yet- thanks. I think the KickBack is an exciting addition to the line for sure! I totally agree with the kickstand assessment…that leg flexes a LOT when there’s a heavy load onboard. I’m gonna have to scrape together some funds to get the centerstand — I really like how it lifts the rear wheel off the ground, too. Another alternative is a really fancy centerstand called “The Rolling Jackass” (http://bikehugger.com/2008/07/rolling_jackass_center_stand.htm). Cable-actuated and handmade by Val Kleitz of Seattle Bicycle Supply…a bit pricey but you could park an elephant on top of this thing! I find it a little disappointing (but only a little) that the Radish comes as a complete bike, yet it is still constructed as a bike+Free Radical instead of an integrated longtail bike. I suppose it’s easier and cheaper to outsource a frame and paint an existing product to match it than to engineer and tool up for a completely new frame. It would have been nice to see another integrated setup on the market, though, especially from XtraCycle themselves. Jack, maybe you can recycle some of your old bike stuff into it. I think the reason the Radish is a sudo-long tail is so you can use their Free Radical or Adventure racks. Not limiting you to one or the other. I think Cafn8 meant that the tail end is still a bolt on versus one piece like the Big Dummy. Either original or adventure racks would work with an integrated frame like the Big Dummy. Question – how does the center stand stay up while riding? Is it spring loaded somehwere internally? Bingo. That’s what I meant. Seems like a missed opportunity, though I can understand why the decision was made to build it as a bolt on. I suppose everything from engineering to tooling cost to shipping carton size were considerations. The issue of pricing does keep coming up for us. We are a boutique brand with tiny overhead, and high costs. We do not externalize costs by using cheap labor in environmentally questionable factories. That should help frame the concept of the Radish. We wanted to release this new bicycle quickly, and capitalize on the economy of scale that we’ve developed with the Free Radical frames. We worked from there to build the front half to integrate cleanly with the existing Free Radical. This let us do a complete bike for $1199, instead of $1599, or $2299. We try to be open about the realities of this industry, so if anyone wants to chat about it, email me, or post here, or on our blog, or even find us on Twitter (twitter dot com slash xtracycle). I’m sure a lot of thinking went into the “build long tail vs. bolt-on” for the new Radish, but it seems to be in keeping with their new “open source” strategy; hey, there are a lot of bikes out there that they’ve spent time making their product work with, why not keep their cost (=our cost) down by using an existing good design? Another reason why they may have opted for this particular design is that it uses that crank-forwardesque setup to make this a one size fits all model. This wasn’t mentioned above, but is great when sharing the bike b/w two different people… “Honey, I’m taking the Radish today!” Er, OK, maybe at this price a twofer is in order! Shek, thanks for the heads-up…unfortunately, welding is not one of my skills. I may hit up this guy for some insight into the design of the centerstand, though! 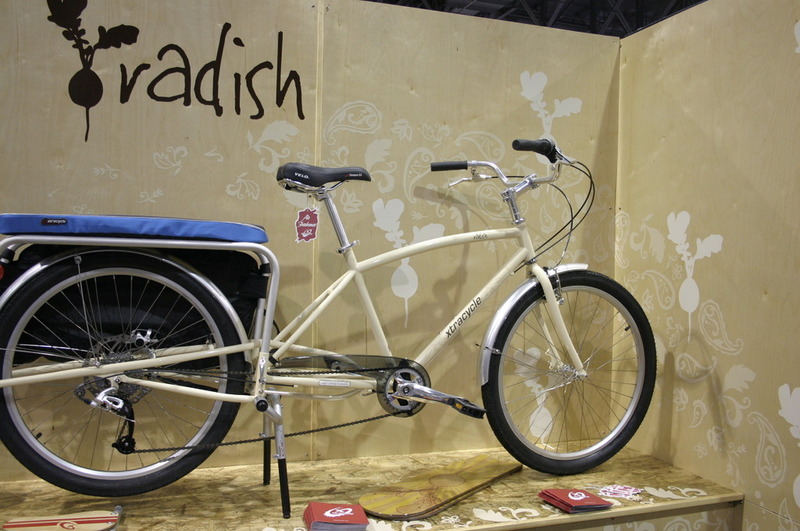 Although I’m not in the market for one, I dig the Radish bike…and it seems just as Gunther said — one size fits [most]all. The FreeRad + bike frame works just fine for carrying superhuman loads, and an integrated frame (liike the BD) is just icing on the cake. I spoke to one of the folks at Xtracycle today about the KickBack. It is spring loaded, will fit on Wideloaders, and has it’s own stubs/pivot inserts. Can’t wait to get mine. Thanks for the info! Did they indicate whether you need to remove the kickback’s stubs to insert wideloaders or is it a simple pass through? I’d hate to have to take off the stand to install wideloaders. I may have to do some gymnastics to get mine as their webstore won’t ship to Canuckistan 🙂 Liking the Whatchamacollahs too. Yes, you can use the wideloaders with our KickBack, they pass right through. Email me, jeremy at xtracycle dot com and we’ll discuss dealing with shipping to canada, eh? i just wanted to concur with the point above about not driving much if you own an xtracycle…i assembled my xtracycle 3-4 weeks ago and have used that bike every-single-day and not used my vehicle once during that time for shopping. basically – my xtracycle has changed the way i interact with my neighbourhood – and – I LOVE IT! Thanks for the info. Will do shortly. The kickstand is definitely a welcome addition, but for $140 I’ll have to pass. Maybe at half that price? http://tinyurl.com/valkickstand (as seen in Nollij’s Flickr pages). I believe he is selling his individually hand-crafted pieces at about $200. I exchanged email with him a long time back and came close to buying, but chose to wait. See this topic on the Xtracycle forum for more history and why I think the Kickback will be very welcome, even at the current price. Why I’m buying one: My X has taken too many a dive when I’ve misloaded it or unloaded the left side of the bike first (ooops). I’m looking forward to something that will be solid and can clearly be adjusted to suit the needs of the bike, the load, and the cyclist. That simply doesn’t come at an inexpensive price when built with some ethical business practices. for all of you that don’t have stocking Xtracycle dealers. The distributor QBP that many shops deal with now has the 700c and 26″ xtracycle kits in stock.